The mission of Doane Stuart is education for students from every quarter. 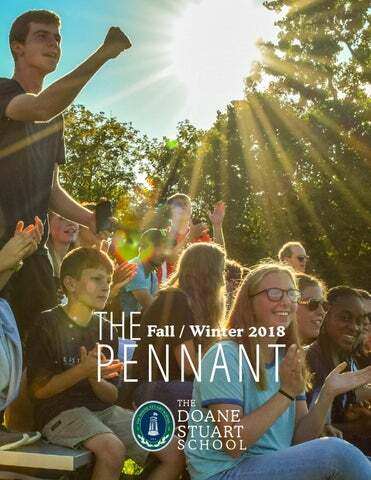 In a college preparatory context, where the joy of discovery is valued, Doane Stuart emphasizes serious study, educates to social responsibility and lays the foundation for a strong faith. Molding Medical Minds - Meet our alumni/ae making waves in the medical and health care fields and discover how their time at Doane Stuart influenced their career paths. The 2018-2019 school year brings with it not only change and excitement, but also the opportunity to re-affirm the aspects of Doane Stuart that make us most unique and most proud. As we prepare our college-bound students for what lies ahead academically, learn more about Doane Stuartâ&#x20AC;&#x2122;s approach to the college process. This year alone, Doane Stuart has more than 50 groups of siblings and legacies currently enrolled. We want to share with you more about our greatest compliment. School in the greater Capital Region. “best kept secret” in the region. changes necessary for future growth and economic sustainability. Generations of families who have already embraced our Mission are working hard to ensure that Doane Stuart continues to be the premier independent school in this region for many years to come. grandparents, and even great grandparents who previously attended and graduated from Doane Stuart, Saint Agnes or Kenwood. Although their time as a family with a student at Doane Stuart has come to an end, they will always be part of the DS community. See Pg. 41 for more about current siblings and legacies enrolled at Doane Stuart this year! Libasci ’17 with their parents Jon and Argelis Libasci 5. Dante Perrotto ’18 with his parents Debra and Brian Perotto ’84 6. Claire Bender ’18 with her grandmother Pheobe Bender SA ’51 at her commencement in front of a photo of Claire’s great grandmother Kate Easton SA ’21. ME E T OU R ALU MN I/ AE M A KI NG W A V E S I N TH E H E A L TH C A RE FIE LD . F R OM N EU R OP S Y C H O L O G Y A ND R E H A B I L I TA TI O N, T O P H ARMA COLOG Y A N D O R TH O PE D I C S U R G E R Y , S E E H O W THE I R TI ME A T DOA N E S T U AR T I NFL U E NC E D TH E I R C A R E E R PA TH AND H OW T H EIR DEDIC A TI O N I S M A KI NG A D I FFE R E NC E .
with a patient and my job is to examine their cognitive skills using various objective, standardized tests. Typically, I spend about half of my week in direct contact with patients and the other half scoring, interpreting data, and generating reports to answer the questions that the referring provider posed. I see adults only, and I’m one of four providers at AMC. WHEN DID YOU “KNOW” YOU WANTED TO PURSUE THIS CAREER? WAS THERE SOMETHING OR SOMEONE IN PARTICULAR THAT INFLUENCED THIS PATH FOR YOU? The circumstances that led me to my career are a little bit unusual. I knew that I wanted to be a neuropsychologist when my young cousin was diagnosed with a glioblastoma (a brain tumor that is typically fatal). I became fascinated with the brain and the way that it works – and also with the compassionate and life-extending care that she received – and the ways in which her quality of life was improved by her providers’ thoughtful recommendations. HOW DID YOUR EDUCATION AT DS PREPARE YOU FOR OR HELP YOU IN THIS CAREER? I truly believe that I never would have found my way to Wellesley College if it weren’t for Doane Stuart. Because of the very small classes and the attention that I received, I was encouraged that I could do – and be – anything that I wanted to be. “I entered college as a confident student who wasn’t afraid to advocate for myself in order to find the best opportunities.” Although I was always a good student, I was quiet and I never would have excelled under different circumstances. Doane Stuart also prepared me for college – I entered as a confident student who wasn’t afraid to advocate for myself in order to find the best opportunities. As a result, I was one of eight in my graduate school class. and bone from my hip, fused my neck. and assist them in scheduling interviews for a new position. physical therapy and I told her I wanted to run again. employer at a wage comparable to their pre-injury wage. run half marathons and do my best to keep in shape. OR HELP YOU IN THIS CAREER? want to enter the field in which I am currently working. retraining program which would accomplish this goal. Maryland, Virginia and the District of Columbia. IN PARTICULAR THAT INFLUENCED THIS PATH FOR YOU? came one night during my junior year when I attended a career information session hosted by one of the student organizations on campus. I learned about Regulatory Affairs and various careers for pharmacists in the pharmaceutical industry from a recent graduate of my college. That meeting ultimately led me to pursue a Post-Doctoral Fellowship in Global Regulatory Affairs and started my career in the pharmaceutical industry. HOW DID YOUR EDUCATION AT DS PREPARE YOU FOR OR HELP YOU IN THIS CAREER? First and foremost, I have to thank my science teachers at DS for sparking my interest in the sciences and providing the quality education needed to be successful in this field. Additionally, DS provided an excellent foundation for development of key soft skills that are important in healthcare and business. In the classroom, we were taught problem-solving skills and how to be effective communicators. Outside of the classroom, skills such as teamwork and leadership were instilled in us. I split my time between our office in Cambridge, MA and working from home. Our office is an open concept, flexible-work space where colleagues can move around throughout the day. Personally, I think the best spots are on the 10th floor where the views of Boston are spectacular! However, my favorite “co-worker” resides in my home office - my dog, Avery. FEATURE - Alumni/ae Spotlights DR. PATRICK MARINELLO ’04 WHAT IS YOUR CURRENT CAREER AND WHAT DOES YOUR WORK ENTAIL ON A DAY-TO-DAY BASIS? I am an Orthopedic Surgeon who specializes in hand and upper extremity surgery. I work at the Bone and Joint Center and I am part of Capital Region Orthopedic Group. I see patients in clinic and operate in both our outpatient surgery center and in the hospital at Albany Medical Center and St. Peter’s hospital. I also work with the orthopedic surgery residents at Albany Medical Center where I am involved in their teaching. WHEN DID YOU “KNOW” YOU WANTED TO PURSUE THIS CAREER? WAS THERE SOMETHING OR SOMEONE IN PARTICULAR THAT INFLUENCED THIS PATH FOR YOU? I always knew I wanted to be a doctor. My father is a family physician and I remember going around with him as a kid in the hospital and in the office. Over time, I developed my love and interest for orthopedic surgery. During residency I was able to choose hand and upper extremity surgery as an additional focus of training. HOW DID YOUR EDUCATION AT DS PREPARE YOU FOR OR HELP YOU IN THIS CAREER? My education at Doane Stuart was foundational to my current success. From a young age I was challenged academically and had teachers who were invested in my success. I was exposed to an excellent science curriculum early and this helped me succeed in college and medical school. THE CURRICULUM DIFFERENCE Working at an independent school, teachers are not required to teach to a test, but may create dynamic and original lessons that enable students to go as deep and far into a subject as they wish. The goal at Doane Stuart is never a score, but for students to think critically, see how disciplines relate to and inform each other, and to discover the passion for education that will ensure they become lifelong learners. Advanced Biology students are now able to grow and study cells. See Pg. 14 to learn more about the Bender Scientific Fund that provided us with this impressive equipment. In Memoriam THE DOANE STUART SCHOOL IS SADDENED BY THE PASSING OF A DEAR FRIEND, FORMER TRUSTEE AND PAST PARENT, MR. MORRIS MASSRY. Mr. Massry was instrumental in the creation of Doane Stuart when Kenwood Academy and St. Agnes School merged. Mr. Massry’s daughter, Sheila Massry Koppel, was a graduate of Doane Stuart. long-time trustee and was elected President of the Board in 1980. In 2005, Mr. Massry received Doane Stuart’s Rev. David Standish Ball Distinguished Trustee Award. Mr. and Mrs. Massry were the Chairs for Doane Stuart’s 30th Annual Spring Gala & Auction. We are grateful for their generosity and especially honored by their gift of the beautiful 7 branch Candelabra that hangs proudly in our Golub Interfaith Chapel. In addition to Doane Stuart, Mr. Massry served and chaired many of the nonprofit boards on which he sat, including: The United Way, The Troy Savings Bank Charitable Foundation, Excelsior College, Russell Sage College, St. Mary’s Hospital, Center for Disability Services, Jewish Community Center in Troy, Daughters of Sarah Nursing Home, National Board of the Daughters of Charity, University at Albany Foundation, Proctors, and Temple Beth El. Mr. Massry was the founder of Massry Realty Partners. Mr. Massry and his family supported so many organizations in the Capital Region. Most recently, Albany Medical Center opened the Massry Family Children’s Emergency Center, the region’s only pediatric emergency room. Doane Stuart and the entire Capital Region has lost a great friend. Our thoughts and prayers are with the entire Massry Family. Alav Ha-shalom. Doane Stuart is thrilled to have welcomed some new faces to join our community for the 2018-2019 school year. Welcome New Trustees: undergraduate, is married with two children who attend Doane Stuart (Grades 3 and 5), and currently divides his time between East Greenbush and northern Lake George. Dandan Wu , of Guilderland, is Associate Professor of Finance and Co-Chair of the Accounting, Finance, Financial Planning, and Economics Department at The College of Saint Rose. Dandan received her Bachelor of Science and Finance from the Beijing University of Aeronautics and Astronautics in China and her Ph.D in Finance from Washington State University, where she also served as a Research Assistant and Instructor. Dandan has been active on numerous committees at Saint Rose and is a frequent panelist at meetings and conferences focused on financial management. 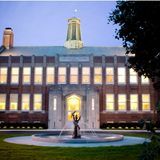 the Troy School District, where her responsibilities included co-teaching World History. of St. Andrews in Scotland. Dan worked for a decade as a newspaper and magazine journalist, covering the arts, municipal government, and education. During his time as Assistant Director of Admissions at Connecticut College, he served for seven years as liaison to Capital area schools, including Doane Stuart. With an 8:1 student to teacher ratio, teachers and students are able to collaborate and communicate in a manner that can be difficult in larger settings, personalizing the educational experience, promoting independent studies and conversations outside of class, and adapting to each child’s unique approach to learning. Also, students learn to learn from each other and view each other as an asset in their own education, building unity. process of dying or already dead. and a 64-page illustrated manual. and enjoy the coding and creativity demanded by robotics. It is Doane Stuart tradition to kick off the School year with a series of outings and events with one common goal: to build and strengthen the sense of community and togetherness across classes and divisions and between students and teachers. At the start of school, the class of 2022 traveled to Camp Chingachgook in the Adirondack Mountains for their Freshman Retreat. Each year, the freshman class is led in two days of adventures including team building exercises and games, rock wall climbing, canoeing and more. The Retreat brings the freshman class together for the first time and allows students the opportunity to meet their classmates and teachers and make new friends. Most importantly, it is a chance to have a lot of FUN! The Middle School once again enjoyed two days of fun, adventure, community and team building at Skye Farm, a favorite tradition for over 20 years. The students swam, canoed and hiked. New students participated in the tradition of choosing either a Blue Team or Green Team allegiance. Skye Farm brings Middle School students together in the spirit of community, friendship and teamwork, with the goal of carrying that spirit on throughout the school year. The 6th annual Back-to-School Barbecue brought over 300 members of the community together on a perfect fall evening. After an exciting boys soccer match everyone enjoyed great food, great friends and great school spirit! A huge thank you to Mona Golub (parent of Ira â&#x20AC;&#x2122;15) and Price Chopperâ&#x20AC;&#x2122;s House of Barbecue, for cooking delicious hot dogs, hamburgers, potato salad and macaroni salad, and to the families that brought side dishes and desserts. Doane Stuart seniors also came together for their annual overnight Senior Retreat. The students, along with Upper School faculty, like the freshmen, traveled to Camp Chingachgook and participated in icebreakers, problem solving, a high ropes course, and talked about leadership and the role each one plays in maintaining a sense of community and respect, not only at school but also in their lives outside of school. The Lower School gathered again this year at Bowman Orchard to spend the day together as a community and to have tons of fun learning about how apples grow and how they get from the tree to the market. The children especially enjoyed picking apples, eating cider doughnuts and drinking fresh apple cider. They also played on an amazing wooden playground and met several farm animals. GALA 2018 On April 14, 2018, Doane Stuart’s Spring Gala and Auction raised more than $132,000! This is wonderful news for Doane Stuart, as 100% of the proceeds from the Gala benefit Doane Stuart’s Financial Aid Programs and Faculty Compensation. Doane Stuart would like to thank our Gala Chairs Steve Kroll and Tricia Asaro, parents of Kate Kroll ’21 and Jack Kroll ’25 and our amazing auctioneer, Leanne Robinson Maine ’94. Save the Date for next year’s Gala on April 6, 2019! SCAMP The third year of Doane Stuart’s summer program, SCAMP (School + Camp), was a huge success. More than 60 children, ages 3-8, participated throughout the summer months. The program was again coordinated by several Doane Stuart teachers, and this past summer incorporated many STEAM focused activities in addition to music, drama and more – all designed to be fun! Visit DOANESTUART.ORG/SCAMP for info and dates for SCAMP Summer 2019! Ganeles ’19 Named a National Merit Semi-Finalist Brian Ganeles, Student Body President, was named a National Merit SemiFinalist. The National Merit Scholarship Program is an academic competition for recognition and scholarships that began in 1955. High school students enter the National Merit Program by taking the Preliminary SAT/National Merit Scholarship Qualifying Test (PSAT), which serves as an initial screen of approximately 1.6 million entrants each year. Of the 1.6 million entrants, about 50,000 with the highest PSAT scores qualify for recognition in the National Merit Scholarship Program. Ganeles said the practice tests given during the SAT preparation course (offered free to all Doane Stuart juniors), enabled him to build confidence and stay calm during the testing, and he encouraged students to take the practice tests when possible. To compete to become a Merit Finalist, Semi-Finalists must demonstrate high standards, which include not only their performance on the SAT but also on the rigor and record of their academic program, their activities and school leadership, and on an essay. In February, some 15,000 Semifinalists are notified that they have advanced to Finalist standing. Beginning in March, about half of these students are awarded scholarships. Pictured in the front row, from left, Caleb KarkariMensah ’20, Isabel Barats ’20, Olaposi Peters ’19, and Maya Lautenberg ’19. of Pennsylvania; and Steven A. Rosenberg (MD, PhD), National Cancer Institute, National Institutes of Health. The scientists were recognized for their work on immunotherapy, which has led to innovative new drugs for cancer, HIV, and other diseases, with many already saving and extending the lives of tens of thousands of patients. The three shared a $500,000 award. Grandparents and Special Friends Day Lower and Middle School students once again welcomed grandparents and special friends to the Golub Interfaith Chapel for Doane Stuart’s annual Grandparents and Special Friends Day celebration. After being welcomed to Doane Stuart by Mrs. Duker, Lower School students and the Middle School choir performed a selection of songs, shared the book “Babysitting Grandma & Grandpa” and their own “movie,” which showed their favorite activity with their grandparents. Following the Chapel, students invited their guests to their classrooms for activities and to see some of the work they have been doing in School this fall. The free day-long event, the largest of its kind in the Capital District, featured displays, workshops, and products that promote renewable energy and sustainability. Discussions focused on geothermal and solar energy, energy efficiency, and conservation practices and the Capital District Electric Vehicle Drivers Club discussed the benefits of electric cars. (pictured) and addressed those in attendance. beneficial to her performance on the PSAT. of the School’s Green Roof. 435 pairs of new socks, which were donated to Joseph’s House in Troy, NY. Socks are the number one item requested by homeless shelters. its mission is to provide non-judgmental services to end homelessness. determination, empowers guests and tenants to make healthier choices. National Chemistry Day Doane Stuart proudly took home the award for “Best Themed Booth” at the American Chemical Society’s National Chemistry Day event held each year at the New York State Museum. The theme this year was “Chemistry is Out of this World.” Doane Stuart was a sponsor at the event, where we were able to greet approximately 250 children with exciting experiments and activities at our “Chemistry-in-Space” themed booth. Science faculty and student volunteers guided the children and their families through stations where they were able to create and take home a “stellar nebula” by mixing gasses (colored water), space dust (cotton balls) and stars (glitter) in a bottle, test a real-life meteorite for the presence of nickel and even study the light spectrum of different gasses to help identify planets. IDENTITY It is not just in our 19th century history that we proved ourselves committed to respect for difference of religion. In 1975, the union of our areaâ&#x20AC;&#x2122;s oldest independent Episcopal school and oldest independent Catholic school assured that compromise and visionary reconciliation would establish the institutional benefit of learning from people not like oneâ&#x20AC;&#x2122;s self. HERE WE EXPLORE HOW DOANE STUART IS EVOLVING, MAINTAINING THIS MISSION AND SETTING THE STAGE FOR A NEW GENERATION OF POSITIVE AND SPIRIT DRIVEN STUDENTS. individual contributes to the collective. Nearly two decades ago, for example, Doane Stuart opened its doors to a local Buddhist congregation, which was not welcomed in its local neighborhood and was unable to find a suitable place for teaching and worship. The School entered into an agreement with the congregation, giving it sanctuary. In part, the congregation paid its rent by having one of its leaders teach a yearly course in Buddhism to Upper School students, and made its worship space available to Lower and Middle School students who learned about Buddhism. THE TRADITION DIFFERENCE By enrolling in Doane Stuart, students inherit over a century and a half of history, with traditions that give shape and meaning to the academic calendar and that connect them to the seasons, the larger community, and to each other. Doane Stuart students discover something vital that extends far behind and far ahead, but also creates a bond and a belief in the Doane Stuart mission that ensures Alumni support the school and serve as a resource for graduates. our Kenwood / Sacred Heart histor y. During the ceremony, junior students are presented by the senior class with their school rings, marking the passage from a junior to a senior. The seniors are then gifted a flower as a thank-you for their guidance and support. wisely, and safely, and with confidence. throughout Asia and its recent introduction in the West. GOD(S) AND HUMANS examines the relationship between humanity and religions, between humans and God(s) and the concepts of good and evil. To achieve this, students survey the characteristics of religion with a focused study of a few individual religions and look at the nature of reality. SOCIAL JUSTICE AND PERSONAL ETHICS examines issues of social justice, “the way in which human rights are manifested in the everyday lives of people at every level of society.” The social justice principles include: equity, diversity and supportive environments. Students examine issues such as: poverty, environmental rights, access to health care, labor laws, civil rights and the death penalty. ISSUES IN PHILOSOPHY This course examines the philosophical questions and issues with which Western philosophers have grappled since the inception of philosophy itself. Topics covered include God and Religion, Science and Method, Epistemology, Ontology, and Beauty and Art. 2018 REUNION What a Success! with our ’96 All Star Band featuring Graham Tichy and Ian Carlton. We had guest performers, including Leanne Robinson Maine ’94, Abigail Wolff Mariani ’78 and Michael Cannon ’08. On Saturday we recognized all of the Anniversary Classes, with special recognition of our 50th and 25th Anniversary Classes, and the 16 alumnae who were celebrating their 50th or more class reunion. celebration will take place October 18 & 19, 2019. All alumni/ae are invited to attend and we will give special recognition to the following Anniversary Classes: 2014, 2009, 2004, 1999, 1994, 1989, 1984, 1979, 1974, 1969, 1964, 1959, 1954, 1949 & 1944.
including one against rival Loudonville Christian. Coach Dr. David Wells with 1st Team All Star Abe Gordon ‘19 and 2nd Team All Stars Ben Guilbault ‘21 and Joseph DiPreta ‘21. Several members of the team, which also includes players from Rensselaer High School, have been named to the Central Hudson Valley League C Division’s All Star roster. First Team All Stars include Kyaw Lwin, a seVnior from Rensselaer, and Abe Gordon, a Doane Stuart senior. Second Team All Stars include Doane Stuart sophomores Joseph DiPreta and Ben Guilbault and Rensselaer sophomores Ki Paw Hoo and Nelson Htoo. The JV team steadily improved with each game this year. team made great strides and is proud of their strong finish to the season. Coach Mr. Jim Wheaton with All Stars Alyssa Calcagno’ 20, Hannah Esslie ‘22, Maya Lautenberg ‘19 and Leilah Mariposa ‘19. excessive heat (a feature of much of the early season). and out of the league. A win against rival Heatly was another high point of the season with Maya Lautenberg tying the game early with her first Varsity goal as well. While the team says goodbye to seven seniors, prospects look bright for next season. THUNDERCHICKEN NEWS THE ATHLETICS DIFFERENCE The Doane Stuart Thunderchickens like to win. And they do, quite often. But athletics at Doane Stuart is about promoting a healthy lifestyle, sportsmanship, teamwork, and character. There are no cuts on Doane Stuart’s sports team. Everybody at any level is welcome and encouraged to be part of the team, as sports build friendships and school spirit and provide balance and stress relief in a student’s life. SPORTS FOR ALL (pictured) ALL students at DS are encouraged to explore playing a sport, regardless of any prior experience. The Boys Varsity Soccer team has for many years welcomed players from Rensselaer to the team when a team at Rensselaer could not be formed (other merged sports include volleyball and tennis). This partnership has been invaluable to both schools and their players and is just another example of athletics the Doane Stuart way. Polynice ‘25, Bryan Cole ‘25, Jackson Wells ‘25, and Derek De Santo ‘24. join Rensselaer Rams for Volleyball and Tennis! Girls Volleyball Rensselaer’s Varsity and JV Volleyball Teams also welcomed Doane Stuart students this fall. Abigail McMeel ’22 played at the Varsity level this season, while Irene Frias, Amy Newberg, and Icesis Hinkson-Serrano (all class of 2022) helped the JV Team to a 13-5 W-L record and a 3rd Place finish in the Patroon Conference. (l-r ) Girls Varsity Volleyball: Abigail McMeel. Girls JV Volleyball: Icesis Hinkson-Serrano, Amy Newberg and Irene Frias (all class of 2022). Rather than working backwards from a theoretical career you have never tried, think about your strengths and weaknesses, and the classes you have most enjoyed during high school. While it may be tempting to think about a career, start from what you know, not many steps into the future. H AV E F U N ! L O O K I N G AT C O L L E G E S I S EXCITING. IT DOES NOT NEED TO BE STRESSFUL, OR A CHORE. You have tremendous support at Doane Stuart, and should use all of us as a resource as much as you can. THIS PROCESS IS PERSONAL. Spending time comparing yourself to other students will not help you find good matches. Reflect on your own experiences and interests and let that guide your journey. Similarly, remember that one person’s opinion or experience is just that. Things may have changed since your Uncle Luke was in college in 1985. Instead of relying on others’ rankings, create your own! Don’t assume U.S. News knows the “best” colleges – they are in the business of selling a product, not helping you. KEEP WORKING HARD AND GETTING GOOD GRADES. T H I S I S N OT A FATA L I ST I C P R O C E S S, NOR IS A COLLEGE’S DECISION A REFERENDUM ON WHO YOU ARE. advantage of all that Doane Stuart offers. schools, and never let a “no” letter derail your sense of self! IT IS NOT NECESSARY TO KNOW YOUR I N T E N D E D M A J O R AT A N Y P O I N T I N H I G H S C H O O L . If you have some ideas – great! A S T E C H N O L O G Y E V O LV E S , I T I S I N C R E A S I N G LY I M P O R TA N T F O R ST U D E N TS TO B E M I N D F U L O F W H AT THEY PUT ONLINE. officer, regardless of your privacy settings. U N L E S S Y O U A R E P R E PA R E D T O PAY TUITION IN FULL (FOR 4 YEARS) FOR ANY SCHOOL, YOU SHOULD BE CANDID ABOUT FINANCES. of intentions, this is, simply, not in their best interest. Your and what your expectations are about their contributions. Will your senior need to take out loans? Use earnings from a summer job? Talk about this regularly as a family. Over 100 colleges visited DS in the fall of 2018 Incredibly, over 110 colleges and universities visited Doane Stuart this fall. With a senior class of 31, it is quite a compliment to our students that so many schools from all over the country (and outside the country!) want to recruit them. These meetings all take place in the College Counseling office, during the school day. Seniors should, of course, take the time to meet with representatives from every school they are considering and sophomores and juniors are strongly encouraged to attend as well. These meetings are an opportunity to learn about many schools without leaving Doane Stuart. Perhaps more importantly, attending these meetings will serve students in the application process, as colleges closely track “demonstrated interest.” The more students engage with colleges, the more likely they are to enroll. Colleges track this very closely, so attending the meetings portrays them as serious applicants. The admission representatives who come to DS are the same individuals who will be reading applications from our school. How interested are you? The Common Application has significantly changed admissions, notably by making it easy to apply to multiple schools with the click of a button. As a consequence, colleges have struggled to determine how sincerely interested applicants are in actually attending their school. Colleges closely track a student’s level of interest and many weigh it heavily in determining an admission decision. This is known as demonstrated interest. Thus, if a student wants to be considered a serious applicant, he or she must take steps to let colleges know that. This goes for every school to which a student applies – regardless of selectivity. The following are the ways that students can demonstrate their interest in schools: • Complete a formal visit with an information session and tour. • Interview anywhere it is offered. • Add yourself to a college’s mailing list. Click on their emails. Yes, colleges track this. • If prompted to, immediately create an account on the college’s portal. They may track how quickly you did this and how often you login. • Meet with the admission representative who visits Doane Stuart. If they visit junior and senior year, you should come to both meetings. • Attend an open house. • Attend an online chat session with the school. • Email the counselor who reviews applications for Doane Stuart with an intelligent question. • Apply early decision or early action. Failing to do these things can be a costly mistake. Demonstrating your interest gives colleges confidence that, if admitted, you will choose to enroll. Colleges want students who love them! Look back to Pg. 5 for a list of colleges to which the class of 2018 was accepted and to where they have matriculated this fall! THE COLLEGE PREPARATION DIFFERENCE In addition to in-school SAT prep, at no cost to families, visits to DS from college representatives, and annual college tours, students work with a veteran and dedicated college counselor who designs a personalized college search and communicates with students and families at every step of the process to ensure that students find the right fit for their undergraduate experience. Independent school counselors have unique rapport with college admission officers and are able to speak directly and persuasively about a student’s ability to be an engaged and positive presence on a college campus. Upper School students enjoy the opportunity to visit colleges with our Director of College Counseling. From lunches in dining halls to private campus tours, students are introduced to a wide variety of institutions and academic offerings. This year the group of 12 students first traveled to Vermont where they visited University of Vermont & St. Michael’s College to start off their 3-day trip north. They then headed across the border to Canada to McGill University and Concordia University in Montreal, Québec. The group then returned to the US to visit Clarkson University and St. Lawrence University back in New York’s St. Lawrence County. In the Fall of 2017 we produced Annie, the first Doane Stuart Musical production in ten years. (The last musical at Doane Stuart was How to Succeed in Business Without Really Trying way back in 2007). In May 2018 we also performed a student written/student directed play. It was entitled Teenage Stupidity: A Modern Melodrama. Written by Molly Maron ‘20 and directed by Phoebe Lampson ‘19, it wove several popular Greek myths into a storyline set in a modern American high school. Last year we included 12 different solo, duet, trio, and full ensemble numbers from various musicals, including: Funny Girl, Les Misérables, Anastasia, Waitress, Matilda, Willy Wonka, Be More Chill, Beauty and the Beast and, of course, the ever popular Hamilton. Students are allowed to bring their own ideas of what they want to perform and how they want to present it in the Showcase. We performed this in an intimate, theatre-in-the-round setting, which gave the students new experiences with this unique type of theatre. We received some spectacular reviews last year and hope to make it an even more awe-inspiring performance this year. this course. The past few years have been full of a lot of work and dedication from our faculty and, most importantly, our students. Our drama students are always willing to go the extra mile in everything they do. It is their enthusiasm and commitment that has allowed us to finally rebuild a successful theatre program at Doane Stuart. We have several students talking about majoring in theatre-related fields in college, and we are proud to have given so many students a place to not only “fit in” but to thrive at school. These students continue to impress us in their dedication to the craft and we hope these experiences will live on beyond Doane Stuart. Through the magic of theatre, we hope to inspire students to do more of the “impossible” every day. THE COMMUNITY SERVICE DIFFERENCE From early childhood, students are taught to see how their education may be personally fulfilling but also how they may use their knowledge and creativity to benefit the common good. Service is built into the curriculum and several school traditions involve service, so that students will not observe their education in a vacuum but relate it to real world applications. Service occurs within Doane Stuart, as well, as Upper School students serve as mentors and tutors for Lower School students, providing academic benefits while strengthening and expanding all students’ sense of the school community. specialized devices used for mobility by students at the Center for Disability Services in Albany. Last month our students learned about the high tech communication devices used by students at the Center on Manning Boulevard. Other Middle School classes spend their Service Days once a month at the Ronald McDonald House, Catherine’s Closet, and Teresian House, as well as helping out in Lower School and assisting Mr. Snavely with campus cleaning. The program, planned and coordinated by Mrs. Hodgkinson, has been a special component of our Middle School outreach for many years. Music Middle School Band Prepares for Upcoming Concert and Holiday Appearances This year we’re lucky to have one of the largest Middle School bands ever at Doane Stuart. Band members have been learning to play a lively African - American folk tune and also some holiday songs for our annual Kris Kringle get together in December. They’ll also perform along with the Guitar Ensemble and Upper School Jazz Ensemble on January 28th. More siblings and legacies are Doane Stuart students than ever before! who reaffirm the value of hard work and self-expression. Of course, there are also practical matters about uniforms, drop-offs, and school conferences. But there are intangible aspects of the siblings’ presence that gives vitality and camaraderie to every part of the Doane Stuart experience. Oh Brother (and Sister) Where Art Thou? These siblings end an era as the last child in their family to attend Doane Stuart now that their siblings are off to college and beyond. At least we get to keep some of them for a few more years! Bullard, McLeod & Associates, Inc.
Mr. Steven Kroll and Ms. Tricia Asaro Mrs. Susan Cleary Morse ‘89 and Mr. Robert L. Morse Mr. and Mrs. John B. Robinson, Jr. UHY Advisors, Inc.
faculty live this mission every day. these donors benefits our students, our faculty and our School. All gifts, large or small, have an impact on the education our students receive. The entire Doane Stuart Community greatly appreciates your belief in us. Each gift makes a difference in the lives of our students. The Lawrence I and Blanche H Rhodes Memorial Fund Inc. THE INTERFAITH DIFFERENCE As a non-doctrinal institution, committed to globalism and plurality, Doane Stuart encourages students to embrace and understand the origins, traditions, and tenets of all major world religions. Academically, this pursuit connects spirituality to philosophy, history, and civics. Pragmatically, it ensures students are citizens of the world who are able to adapt to new settings and to bridge cultural and social divides. Chapel talks and student led events reaffirm that every person’s voice is valued and heard in the larger dialogue. Early Childhood and Kindergarten constructed their own shofars and traveled throughout the school blowing the horns, which was all done as part of the day’s religion lesson on Yom Kippur. 2017-2018 GIVING REPORT THE THUNDERCHICKEN DIFFERENCE Nothing sums up Doane Stuart student culture like the School’s mascot, the Thunderchicken. How did that come about? When Doane Stuart lacked a mascot in the early 1990’s, the students bound together to elect something they thought represented both the gravity and whimsy of Doane Stuart students. Their choice of the Thunderchicken was at first rejected by the School, but the students persisted and, representing how the School embraces student governance and the student voice, they eventually agreed and formally adopted TC as mascot. ESPN Magazine in 2011 and hailed as “Best Mascot” in the region by the Times Union in the spring, the fall of 2018 brought our Thunderchicken a much deserved new set of feathers! Dr. and Mrs. Orlando L. Cano Jr. THE GREEN ROOF DIFFERENCE Funded by a $1.4 million New York State Environmental Facilities Corporation grant, Doane Stuart’s Green Roof is the only one of its kind in the region, a 22,000 square foot outdoor meeting area and living laboratory with 60,000 plants from 70 different species. With panoramic views out over Albany and the surrounding areas, the roof profoundly reduces storm water runoff and heating and cooling costs, and creates new habitats for insects and wildlife. More than anything it is a breathtaking space for students to rejuvenate and connect to nature. Crasto’s Geometry students gather to find the area of the different sections of the Green Roof. 2017-2018 GIVING REPORT THE CASEY’S DIFFERENCE Doane Stuart refers to its community as a family of families. Even the dining experience at Doane Stuart reaffirms this as the cafeteria isn’t run by a big corporate entity but by members of Casey’s, a family owned restaurant and Rensselaer institution that’s been a presence in the area for more than twenty years. Students and staff rave about the food prepared by Chef Dave and his team, who go to all manner of lengths to personalize the dining experience and work with everyone in the community with dietary needs and restrictions. a nice day outside, you might just find Chef Dave grilling up some chicken for some of his famous “Spiedie” chicken sandwiches. Mr. and Mrs. Robert A. Keute Jr.
Mr. and Mrs. Carl Snavely, Jr. The Giving Report represents gifts made from July 1, 2017 - June 30, 2018. We have made every effort to list the information correctly. contact the Development Office at (518) 465-5222, ext. 203, or at dgallagher@ doanestuart.org. AT T EN T I ON A LUM N I /AE: We wan t yo ur email addres s ! Parents of Alumni/ae: if this issue is addressed to your child who no longer lives at home, kindly notify the Development Office at (518) 465-5222 or at dgallagher@doanestuart.org.